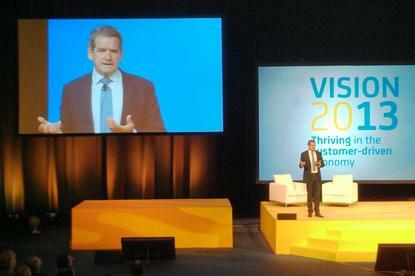 Commonwealth Bank CIO Michael Harte at Optus Vision 2013. “The institutions that have not taken the time to invest in the customer will fall further and further behind,” Harte said at the Optus Vision conference in Sydney. During the global financial crisis, “large institutions were making decisions on behalf of their customers, and they were taking on risk that they didn’t understand; they were packaging up all of those products, they were selling them on to other institutions,” he said. Commonwealth Bank’s customers “require us to be in the real time” and “to have a relationship that is deeply intimate and is based on the valuation of the here-and-now needs and their long-term aspirations,” he said. Shifting IT to focus on the customer can be “a very large cultural transition,” said Harte, adding it took CBA seven years to make the change. “On the technology side, we had a whole lot of people who were used to spending money on infrastructure,” he said. When it began the transition, CBA was spending 85 per cent of its technology budget on service management, he said. “The cost of compute at that time meant that it was impossible for us to move to mobile, impossible for us to have rich, real-time decision making to extend this relationship value,” he said. CBA spent $2 billion taking out back-end infrastructure and now spends only 15 per cent of its technology budget on infrastructure, he said. An Optus report on the future of business released at the event similarly stressed the importance of customer-focused policies. The telco surveyed 550 business and government organisations and 2,177 consumers for its 2013 Future of Business report. The report found that while 65 per cent of Australian consumers expect to have access to the same service and features across all of an organisation’s digital and traditional channels, only 12 per cent of businesses actually deliver it. However, 61 per cent of surveyed businesses said they expect to have integrated channels in three to five years. The report found that 46 per cent of businesses use mobile to engage customers but 82 per cent expected to do so within the next three to five years. Also, 62 per cent use social media and 86 per cent plan to within three to five years. The financial and insurance industries led on mobile engagement, with 62 per cent currently using it to connect with customers. On social media engagement, the leaders were hospitality (89 per cent), retail (69 per cent) and the media/telco industries (67 per cent). Woolworths, a supermarket that has invested heavily in mobile to ease customers’ shopping experiences, had no concerns that an app designed to speed up customers’ shopping trips would reduce revenue from impulse purchases, said Has Fakira, head of multi option retail and IT at Woolworths. “Making the shopping journey easier and quicker will clearly help people make the choice to shop somewhere where it’s a more productive journey,” said Fakira.